Callous is a comic strip that started out as a web comic and eventually, a manually printed version that was released lasy 2010 Metrocon. This time, I was able to buy a professionally printed colored comics for P150 (Summer Komikon 2011). Dr. Carlo's main innovation was to take our inner thoughts and had it materialize into this comic strip. 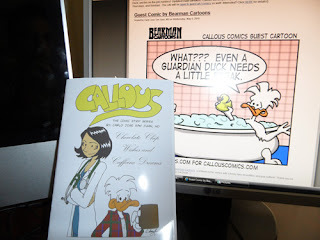 But unlike Julius Villanueva's Life in Progress, Callous focuses on a doctor's working life day-to-day preoccupations. Even if you're not a doctor, one would easily relate to the character's viewpoint. dr. Nicah, the main character, a doctor ( I guess a GP) who loves coffee and cookies (that's why I always crave for some whenever I read this comics), is an intellectual girl who also have qualms about her work. The strip isn't terribly funny. The metajoke is more original. The fact that a theological/moral discussion is breaking out in the middle of the duck and Dr.Nicah's discussion, I would say, makes it a fun read. And it is a pretty good discussion. Every comment is reasonable and well-informed. This may be one of the selling points of the comic strip. But for me, it's more of the light feel of the read that makes it a two thumbs up. Labels: callous comics, carlo san juan m.d.